Although the five-string banjo is by far the most popular type of banjo being played today, decades ago the most popular banjos in the first half of the 20th century were four-string tenor and plectrum banjos. These banjos are really different instruments and shouldn’t be confused with the five-string banjo. Understanding the differences between banjos is important, because before you begin your adventure, you need to make sure you’re traveling with the right kind of equipment. The short 5th string is what makes the five-string banjo different from other types of banjos and from just about every other instrument in the known universe. Most of the time, you know immediately that you’re looking at a five-string banjo when you see a tuning peg (a geared mechanism that keeps the string in tune) sticking out almost halfway up the neck (the long, narrow piece of wood where you fret strings with the left hand; for more on these terms). This tuning peg holds the 5th string of the banjo (see the figure). The 5th string is a crucial distinguishing characteristic of the five-string banjo, both in the instrument’s appearance and in the sound of the music. The 5th string is not only shorter than the other four banjo strings, but this string is also the highest in sound (or pitch). The 5th string on a banjo lies within easy reach of the right-hand thumb, which you use to play this string in all kinds of banjo music. Having the highest-pitched string next to the string with the lowest pitch is unusual in comparison to how pitches are arranged on the strings of a guitar, but this is one of the things that makes the banjo sound so great! This characteristic of the banjo is also one part of the instrument’s ancient African ancestry. 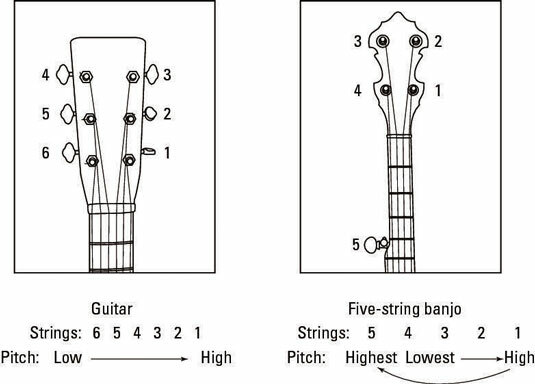 Comparing strings and pitches on a guitar (left) versus a five-string banjo (right).